Which place would you recommend to a tourist for buying souvenirs? If you are into ugg boots and wool products pop over to Elizabeth Street where there are a number of shops that cater to the Korean market selling high quality wool and sheep skin products. For some thing that is very Aussie but not touristy try the Australian Geographic stores (there is one in the Myer Centre). They have a number of interesting items. However while this seems interesting enough you might want to think out of the box and try some other locations. Art galleries are a good source of souvenirs in most countries and the Queensland Art Gallery and GoMA are no exception. There are also a few markets worth checking out. Obviously the South Bank Markets are a good option and they are open Friday night, Saturday and Sunday. 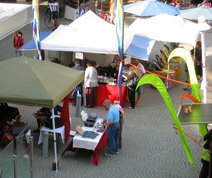 I also like the Eagle Street Markets on Sundays for its range of crafts. The Museum of Brisbane shop has some interesting things that are made in Australia and not too tacky. I second the art galleries and the Southbank markets.